The design of a 15' cruising sailing dinghy by John Perry. "I was looking for a boat which could be trailed by a fairly small car and would be suitable for exploration of shallow creeks as well as coastal and possibly even cross channel trips. The boat needed to be suitable for camping on board using a boom tent with a crew of either one or two persons. I decided to design and build my own boat simply because I like making things and once you have decided to build your own boat it is tempting to introduce a little individuality by doing the design as well." Web Site Snapshot: If available, above is a snapshot of the A fifteen foot dinghy for cruising web site at http://www.btinternet.com/~sail/boatbuild03.htm as it appeared when this site was added to the directory or last verified. 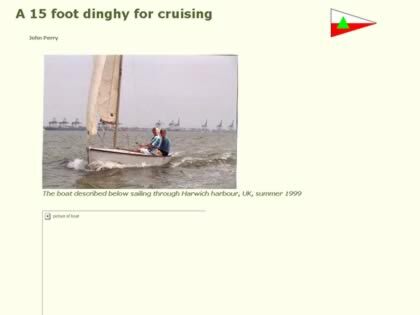 Please Note that Boat Design Net has no involvement with the above web site; all content and images depicted in the above thumbnail are the property and copyright of A fifteen foot dinghy for cruising unless otherwise noted on that site. Description: The design of a 15' cruising sailing dinghy by John Perry. "I was looking for a boat which could be trailed by a fairly small car and would be suitable for exploration of shallow creeks as well as coastal and possibly even cross channel trips. The boat needed to be suitable for camping on board using a boom tent with a crew of either one or two persons. I decided to design and build my own boat simply because I like making things and once you have decided to build your own boat it is tempting to introduce a little individuality by doing the design as well."